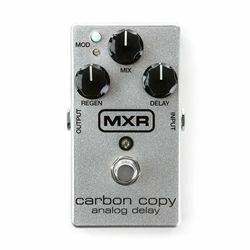 Go from crisp bathroom slap echoes to epic, Gilmouresque delays with the MXR Carbon Copy Analog Delay. Featuring 600ms of delay time with optional modulation, and a three knob layout that controls Delay, Mix, and Regen. In addition, there are two internal trim pots that offer user adjustable width and rate control of the modulation for even more tonal options. All done by a completely analog audio path for authentic rich, warm analog delay made possible only by old school analog bucket brigade technology. True bypass.